Driving to town on a winter day, I occasionally see flocks of white birds where the wind sweeps across fields, blowing snow across the road and exposing the grass. Rising and falling, the birds look like giant snowflakes tossed about by a storm. A closer look reveals that these birds, though mostly white, have a rusty cap and back, black wingtips, and flashing white patches on the undersides of their wings. These are snow buntings, Arctic breeders with a circumpolar distribution, that winter in the northern United States, northern Europe, and central Asia. There have been numerous recent reports of snow buntings to eBird.org, a popular crowd-sourced checklist for birders. These reports suggest that this winter, flocks are scattered across northern New England. In Vermont, a flock of 260 was sighted in a weedy area near the White River in Royalton, and 60 birds were seen at the Berlin Airport. There have also been many sightings in the Champlain Valley. In New Hampshire, the greatest number of these birds have been on the seacoast, where snow buntings frequent sand dunes and salt marshes and feed on tiny crustaceans and other marine life as well as seeds. Flocks of snow buntings are often accompanied by smaller numbers of other Arctic birds such as horned larks and Lapland longspurs. Snow buntings typically begin arriving in northern New England in mid-October and are common by early November. They migrate at night. Experiments have shown they navigate by using the earth’s magnetic field in addition to the stars. Males and females tend to winter in separate flocks. The larger (and probably more cold-tolerant) males winter farther north, perhaps so they can be closer to their breeding grounds. Male snow buntings begin to change to their breeding plumage in late winter, explained McFarland. They lose the touches of brown, and their pure white feathers and black backs make them especially striking. By mid-February, they begin to depart on their journey to the high Arctic. The females don’t follow for another four to six weeks, but are all gone by April. So where do our snow buntings go? 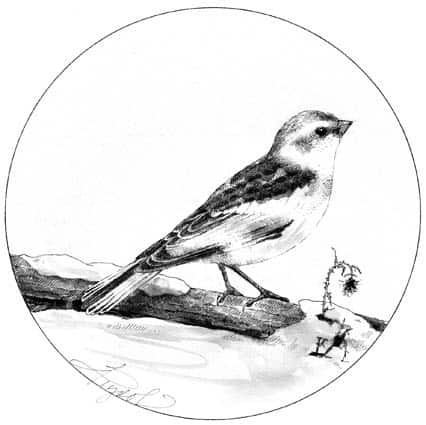 Recaptures of banded birds and data from geolocators (tiny electronic tracking devices) show that most of the snow buntings that winter in the eastern United States breed in western Greenland, while birds that winter on the Great Plains and prairies of southern Canada breed west of Hudson Bay. During spring migration, the eastern population of buntings follows the coast of the Gulf of St. Lawrence, Newfoundland, and Labrador, feeding on insects, berries, and seeds in areas where the snow has melted. Male snow buntings are the earliest songbirds to return to the Arctic. The first males arrive in Greenland in early April, six to eight weeks before nesting. At this time, temperatures may drop below minus 20 degrees Fahrenheit and snowstorms may rage for days. Competition for the best nesting sites is likely the reason male snow buntings return so early and brave this harsh weather, said McFarland. Snow buntings nest on the tundra in crevices in rocks and holes in the ground, and there are a limited number of these sites. Although snow buntings are still common and globally abundant, their population is believed to have declined in recent years. According to McFarland, Christmas bird counts indicate more than a 50 percent decline in the last 40 years and he believes research on snow buntings is urgently needed. As the songbird recorded farthest north (with one sighting at the North Pole), snow buntings are an important indicator species that can help scientists monitor changes in Arctic ecosystems. Look for snow buntings in open fields where the wind has blown the snow off. Check eBird before you go for the latest sightings. If you’re lucky, you may see these amazing wanderers from the far north and enjoy the dazzling acrobatics of a large flock. Susan Shea is a naturalist, writer and conservation consultant who lives in Brookfield, Vt. The illustration for this column was drawn by Adelaide Tyrol. The Outside Story is assigned and edited by Northern Woodlands magazine, and sponsored by the Wellborn Ecology Fund of New Hampshire Charitable Foundation: wellborn@nhcf.org.